It's easy to argue that Ubuntu's success is because there's an unlimited supply of investment from its super-rich parent company, Canonical. But Linux isn't like any ordinary software stack. People aren't forced to use it, and we can all choose something else at no extra cost. Ubuntu has to be doing something right. Ubuntu's biggest, and earliest, success has been in marketing itself. It's become a recognisable brand, not only in the Linux community, but in the wider non-technical world. For some, the word 'Ubuntu' has become synonymous with Linux. And that's a vital trick. These are people who would never have considered Linux as a viable alternative to their proprietary operating systems before the advent of Ubuntu. Where previously these people may have thought of our operating system as an arcane command-driven interface glowing from an amber display, they now understand that the Linux experience comes very close to what they're used to, and it's even better when it comes to security and performance. Ubuntu live Marketing the Ubuntu brand has been helped by two things. First, and despite our occasional criticism, there's no doubt that the brown/orange/red colour scheme adopted by both the Gnome desktop and the distro logo has helped to make Ubuntu a recognisable brand. It casts an aura of care over the desktop, and helps new users identify with the people who have created the distribution. Second, Ubuntu came at just the right time. The release of Warty Warthog in 2004 came after years of Linux teething, a period where many PCs and laptops suffered from poor hardware support in the Linux kernel. From a home user's perspective, almost everything was experimental, from USB modems to your graphics chipset and printer. But by 2004 there was a good chance that a standard installation would just work, and Ubuntu was on the inward wave of distributions taking advantage of this new-found stability. From the first release, Ubuntu developers have been canny enough to work only on what's important from the perspective of an ordinary user. To start with, that means hardware compatibility and ease of installation. Ubuntu single-handedly championed the live CD method of installing the distro, letting users test the water before committing to a complete installation, and distributions feel out of step if they don't offer this feature today. 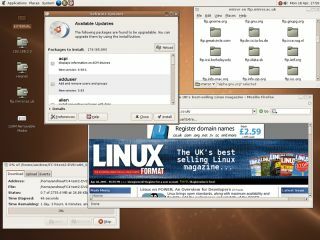 It was one of the first distributions to recognise the importance of a network manager, for instance, and the new 'shutdown countdown' window on both Ubuntu and Kubuntu, as well as the notification system for Gnome, is a continuation of small usability adjustments making a big difference. Rather than throwing everything into the cooking pot, the Ubuntu developers recognise what's important and make sure that it works first, even if that means being late to the OO.o 3.0 party. Over the last five years there have been two other significant factors in its success. First, the rise of Mozilla Firefox has brought open source software – or at least an awareness of it – to every computer. People are now less likely to be suspicious of free software development and understand the role of Linux as a free, open and secure replacement for their operating system. And second, on a related note, the poor update of Vista and the expense of keeping on the Microsoft bandwagon has led computer users to look at alternatives. As it's the Linux distribution with the highest mainstream profile, both of these factors have played into Ubuntu's hands. But Ubuntu hasn't got everything right. The main problem has been the backlash from certain sections of the Linux community who feel that Ubuntu offers nothing new other than a slick Debian makeover and a lesson in marketing. It's also difficult for the average community sponsored distribution to compete with a company that can afford to pay for public relations staff and send out CDs for free to anyone who asks. It created something of an unfair playing field, a backlash from the old guard and a wider audience. It's difficult to say whether those days of flamewars and snobbery are behind us. Five years after the initial release, the Debian ruckus may have finally subsided, but certain people still feel that Canonical is milking the good work of free software developers without making a significant enough contribution of its own. Of course, none of this is against a word of the GPL, which is designed to allow and even promote this kind of use, but Canonical can't buy good PR for the Linux community.